36243 gestempelt (marked) 1867, Luis I. curved value fields perforated issue, petty used collection of 14 values on album page, comprising all denominations incl. two copies 240r. lilac. 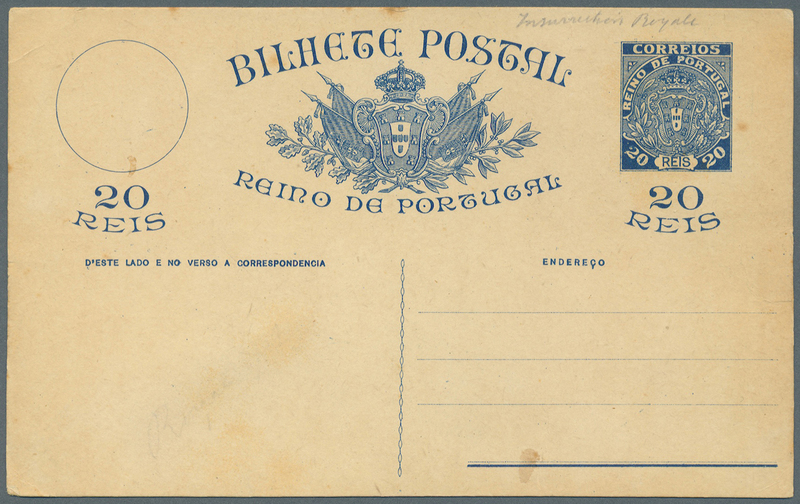 36245 gestempelt (marked) ungebraucht (hinged) * 1867/1870, beautiful stamps of this scarce set of Portugal #27 to #35, postmarks, shades and a nice group of 240 reis #35. For study. 36246 gestempelt (marked) 1870, LUIS I., "fita direita", 25 reis carmine/rose carmine (Mi.38, CE #40), lot with ca.270 used stamps, comprising various perforations, colors, shades, postmarks etc., mostly F/VF condition. Study object! 36247 gestempelt (marked) 1870, LUIS I., "fita direita", 25 reis carmine/rose carmine (Mi.38, CE #40), lot with ca.280 used stamps, comprising various perforations, colors, shades, postmarks etc., mostly F/VF condition. Study object! 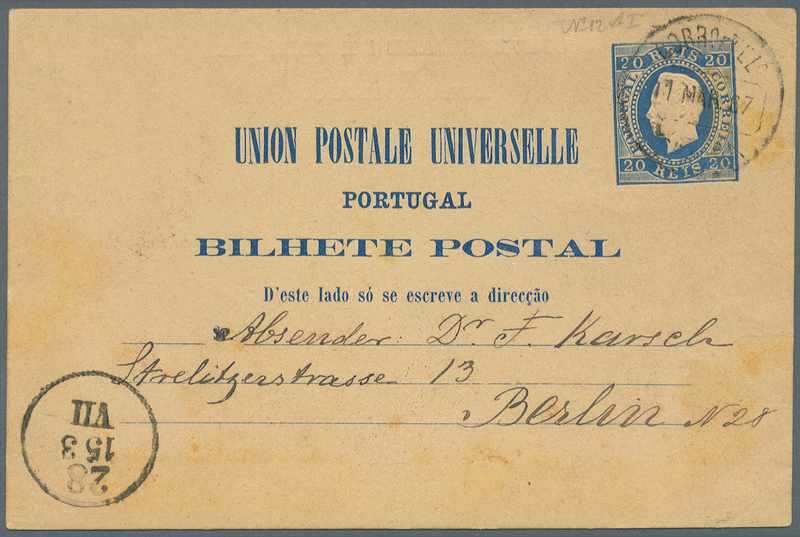 36250 ungebraucht (hinged) * gestempelt (marked) 1870/1884, D.Luis I., a scarce set of Portugal. More than 200 stamps, highlights are #49 green/blue (3),#40 about 25 stamps mint with different shades and types, #66 and 67 with some nice mint stamps. Beautiful set for study. 36251 ungebraucht (hinged) * gestempelt (marked) 1870/1884, LUIS I., comprehensive lot with more than 700 mostly used stamps, predominantly issue "fita direita" with values from 5 reis to 1000 reis, comprising various colors, shades, perforations and postmarks, many stamps in F/VF condition. Treasure trove for the specialized collector. 36259 ungebraucht (hinged) * ungebraucht ohne Gummi (unused without gum) (*) gestempelt (marked) 1879/1892, LUIS I., lot with ca.65 stamps, comprising 1884 500 Reis black, Mi.58*(3), 1887 500 Reis violet, Mi.64 (5 used, 1 MNG) and further interesting items, mostly F/VF condition. 36260 gestempelt (marked) ungebraucht (hinged) * 1880/1887, lot ex Mi no. 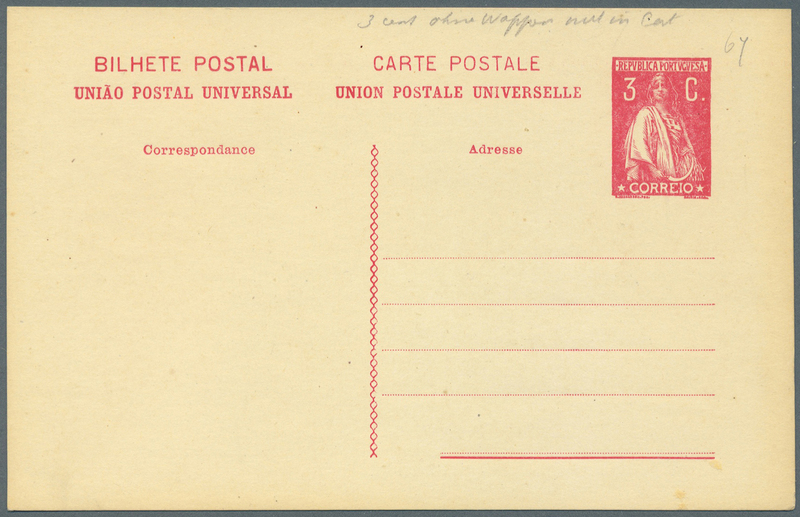 53/64, in total more than 180 used and 8 unused stamps including eight used and one unused copie of the rare no. 58 (Mundifil 64). Mixed condition. Very high catalogue value. 36261 postfrisch (never hinged) ** ungebraucht (hinged) * gestempelt (marked) 1880/1887, LUIS I., 5 reis to 500 reis (Mi. 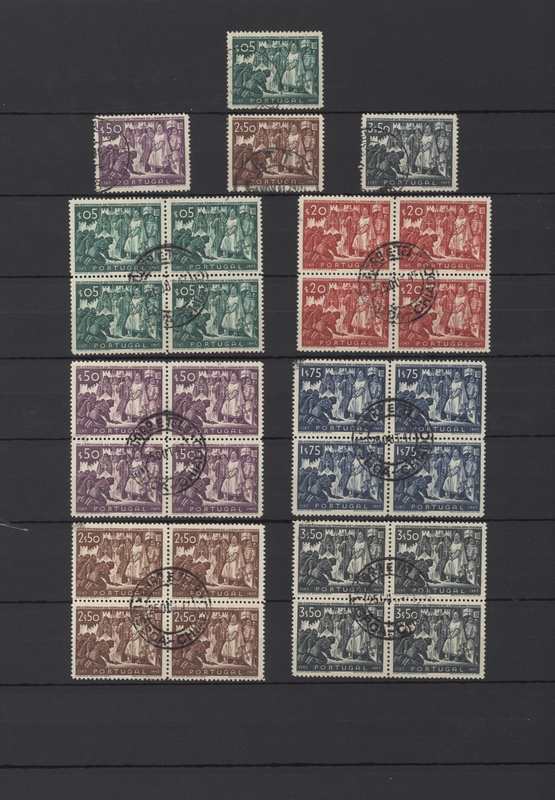 ex 51/63, CE #52/65), very comprehensive accumulation with thousands of stamps, comprising a wide range of colors, shades, types, perforations, postmarks and further interesting items, many in F/VF condition. Recommended treasure trove for specialists. Very high catalog value! 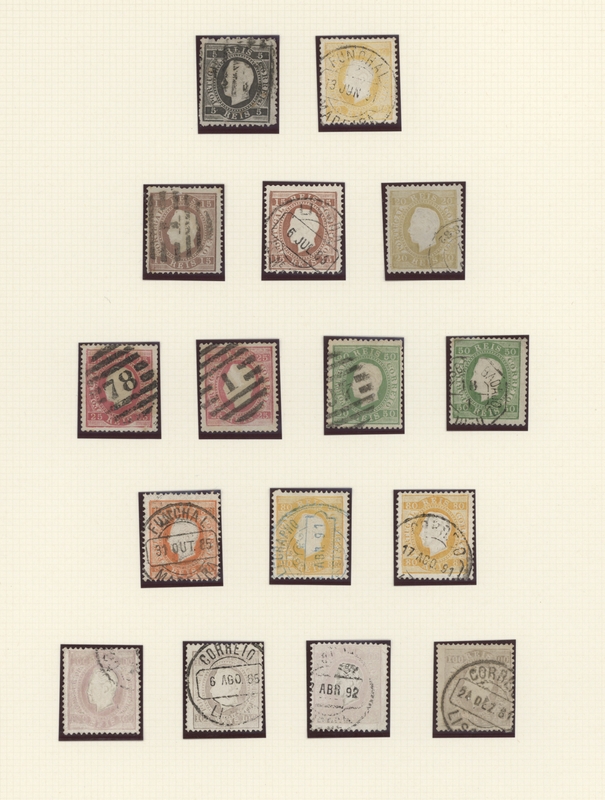 36264 gestempelt (marked) ungebraucht (hinged) * 1892/1893, at least 250 stamps with "Provisiorio" overprints ex Mi. 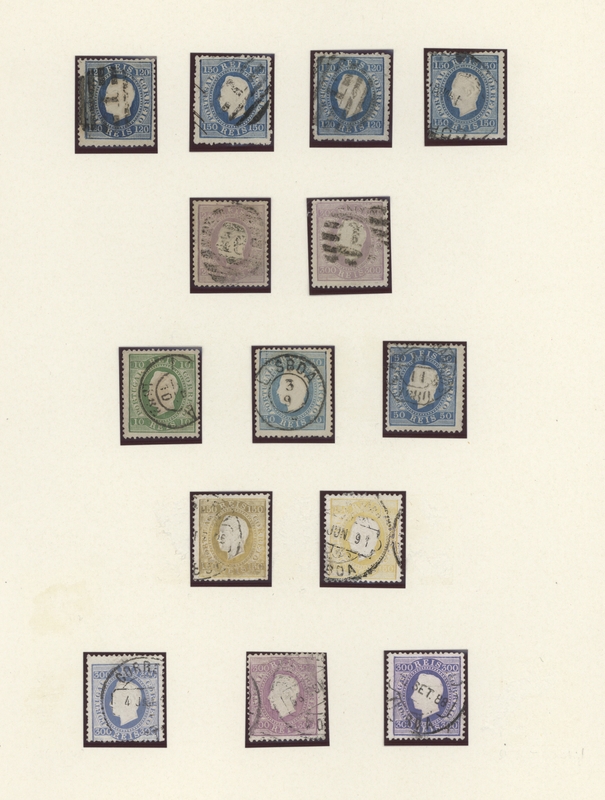 no 78/95 (Mundifil 80/97) mostly used, including 50 r. blue 1893 (three used, two unused) and 50 r. on 80 r. yellow (five unused, 27 used). Very high catalogue value. 36265 ungebraucht (hinged) * gestempelt (marked) 1892/1893, D. Luis I. with overprint "PROVISORIO", a huge stock of this valuable set, we find different colours, shades, postmarks. For study. 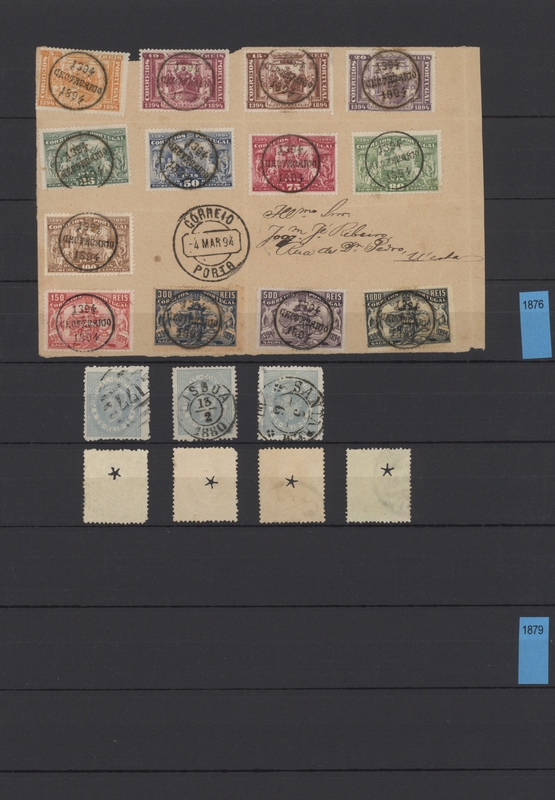 36266 ungebraucht ohne Gummi (unused without gum) (*) gestempelt (marked) 1892/1893, LUIS I., 10 R green, two stamps with ovp "PROVISORIO" and error "1863" respectively "1938" (Mundifil 90a + 90b), both stamps MNG with toned surface, in addition 5 R black (Mundifil 82) used with uncertain diagonal ovp "PROVISORIO" in violet instead of red. 36267 gestempelt (marked) ungebraucht (hinged) * 1894/1895, nice lot with only value of the sets ""Prince Henry" and "Siant Antonio" used and unused, including Mi. no. 119/120 used and 120 unused (Mundifil 121/122). 36268 ungebraucht (hinged) * ungebraucht ohne Gummi (unused without gum) (*) gestempelt (marked) 1895, 700th ann. 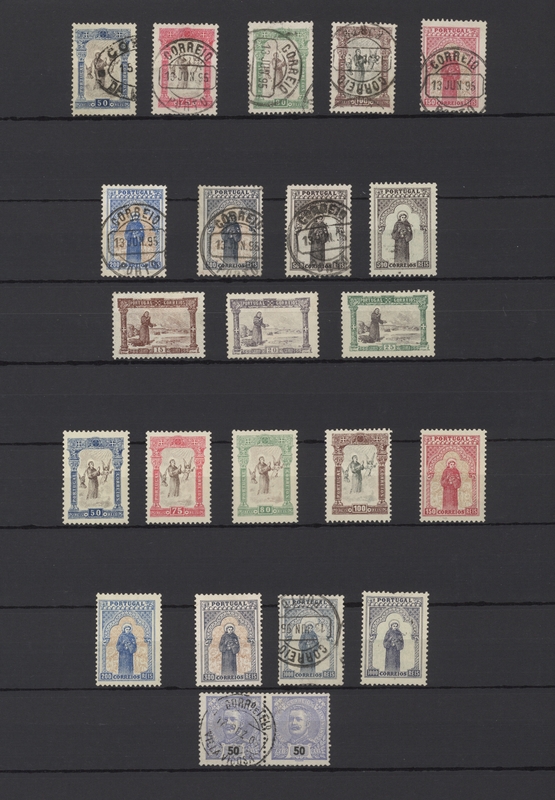 St.Anthony, lot with 43 mint/used stamps, comprising one complete used set from 2 1/2 R to 1000 R (Mi.109/123, CE #111/125), further 2 x 500 R and 3 x 1000 R mint, high catalog value. 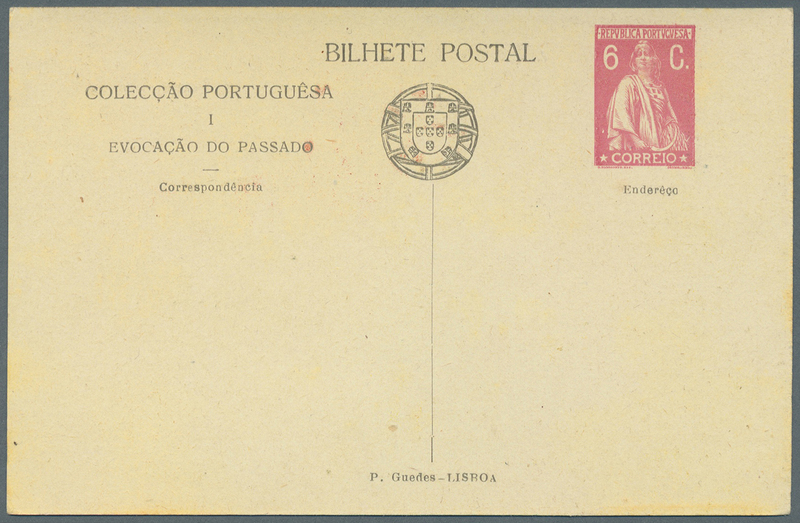 36270 ungebraucht (hinged) * postfrisch (never hinged) ** 1898/1911, Vasco da Gama, six sets of this issue (Mundifil 148/55), one set overprints Portugal (184/191) and eight on Madeira (198/205), mostly mint mounted, a few mint never hinged, some with stain spots. Michel at least 3000,- €. 36271 ungebraucht (hinged) * postfrisch (never hinged) ** 1898/1925, stock of this year´s issues mint mounted, some mint never hinged, always ten sets: Vasco da Gama /Mundifil 148/155), King Manuel II (156/169), overprints 1910 (170/183), overprints 1911 (184/191; 198/205), Flight Lisboa-Brasil (260/275) Camilo Castelo Branco (330/360). Very high catalogue value. 36272 ungebraucht (hinged) * postfrisch (never hinged) ** 1898/1952, nice lot on stockcards, mint mounted, some mint never hinged, contains among others "Vasco da Gama" 1898 and its overprints 1911, overprints 1926 (8 sets), Dom Nuno Alvares 1931 (2 sets), two complete year sets 1952 etc. Michel at least 3000,- €. 36273 gestempelt (marked) ungebraucht (hinged) * 1920/1964, assortment comprising a petty collection on leaves incl. better commemoratives 1940s/1950s, in addition Postage Exemption Stamps for the Red Cross 1927/1936 complete incl. inverted and double overprints! 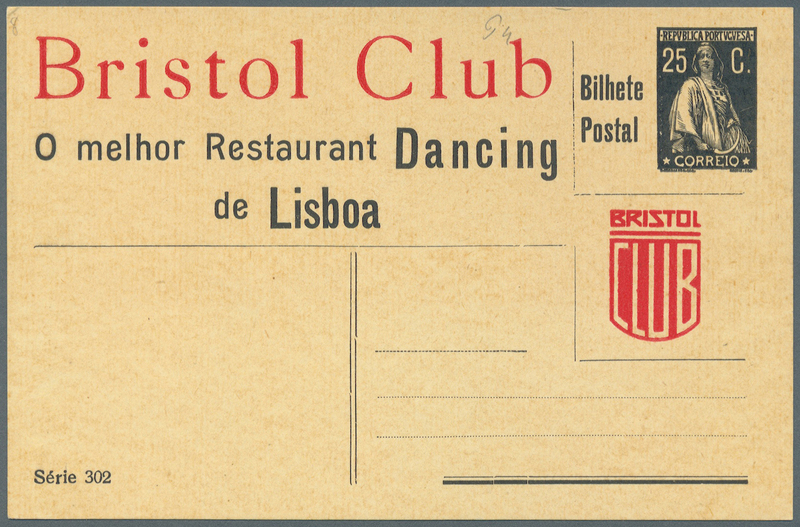 36274 postfrisch (never hinged) ** ungebraucht (hinged) * 1923/1984, substantial accumulation on stockcards with 50 sets "First flight Lisboa-Brasil" 1923, 12 sets "Camilo Castelo Branco" 1925 (Michel 500,- € per set), 25 sets "Dom Nuno Alvares" 1931 (Michel 420,- € per set), 28 year sets 1952, 100 copies of souvenir sheet no. 20, 60 year sets 1983, 100 of 1984 und much more. Mostly mint never hinged, some stamps mounted, stain spots etc. Huge cat. value.